Yesterday and today I’ve set up a new server for colocation. This was the first time I’ve installed a system in RAID and with serial console. First thing to do was buying the hardware and wire and install everything properly. Next thing to do was to check everything works in the BIOS. Nice to see 2,6GB RAM and 2×500GB disks in the BIOS startup screen at once without any trouble. Then install the operating system. 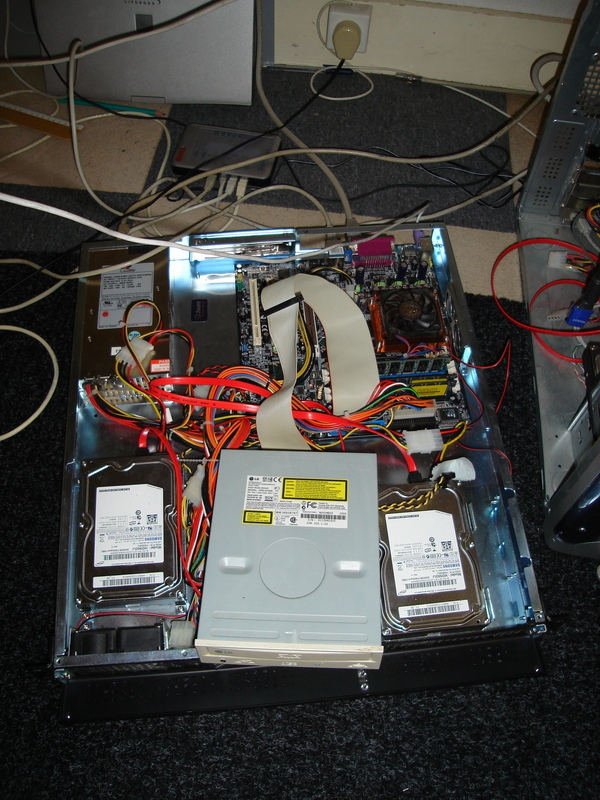 I attached an old DVD drive to the mainboard to start up from CD-ROM. This will be enough for a while in the future. I left almost 400GB of non-partitioned space on LVM, which can be used to extend volumes or add volumes for future expanding. Create on each disk a 200MB for booting and a second partition of almost 500GB for LVM. Partition Type fd (linux-raid). Give the 200MB partition a boot flag. create logical volumes like root, swap, usr, var, etc. After partitioning and installing base .deb packages I choose to install only the standard system set of packages. All other functionality will be in the vservers, which are already there and will be copied from the old servers. Unfortunatly the debian installer left me no choice between boot loaders, I had to use lilo as boot loader. Strange, since I left a boot md0 specialy to use with grub. I’d like grub rather than lilo because if I once forget to run lilo properly after a kernel upgrade, I’ll get stuck with an unbootable server and need to travel to the colocation to fix up things. Grub will always work with serial console even if it can’t find a kernel, because it can load kernels dynamicly from the grub CLI. the installer didn’t use my seperate /boot partition at all, although I’m sure I’ve setup a ext3 formated /boot file system for it in the installer. The md0 device was left ext3 formatted by the installer. Bug somewhere? This entry was posted on Monday, June 9th, 2008 at 2:20 pm	and is filed under English, IT. You can follow any responses to this entry through the RSS 2.0 feed. Both comments and pings are currently closed.